The Peg Perego Gaucho Rock'in Ride On will allow your little one to drive around in style! Take outdoor play to the next level in this ultra sweet ride. You'll have the coolest car on the block. With a 12 volt rechargeable battery and charger, keep the fun drive going all day long. This will get your little one off the couch and computer for sure! Watch as they kick it into gear with the easy to reverse mode and two speed shift option of 2.5 or 5 mph. Parents don't have to worry because the 5 mph lockout feature prevents your little beginner driver from going over the 5mph speed limit. The kids car allows for a safe and fun ride.High traction wheels ride on grass, dirt or concrete, so they can drive almost anywhere whether it be the backyard, the sidewalk or the neighborhood park. This Peg Perego ride on also comes with rear suspension springs that allow for a smoother ride, adjustable seats to accommodate to your growing child and seat belts for extra safety. It even includes an FM radio with MP3 jack to jam while you drive. 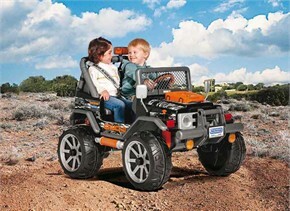 The battery operated ride on features a passenger seat so a sibling or a friend can join in on the adventure! Designed for ages 3 to 8 years old. Weight capacity 130 lbs. Availability:The Battery Powered Ride On Toy takes approximately 2 business days to leave the warehouse plus transit time. Please Note: This Item ships ground ONLY and does not ship express or to Alaska, Hawaii, PO Boxes or APO addresses.